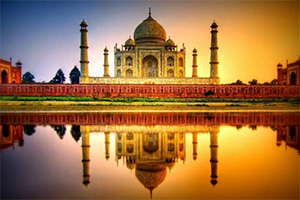 Shine Gold Tours India offers one-day Agra tours from Delhi (7am to 10pm), as well as overnight Agra sightseeing tours that gives enough time to explore each and every tourist site in the city. You also have the option to customise the trip according to the time you have available, and the choice of places to visit in Agra. Most probably you will start sightseeing in Agra by visiting the magnificent Taj Mahal, one of the most admired heritage monuments in the world. The Taj Mahal was constructed by Mughal Emperor Shahjahan in memory of his beautiful wife Mumtaj Mahal. Around 20,000 labourers worked day and night for a period of 17 years to build this marvellous monument. The incredible view of Taj in the morning and evening becomes an unforgettable sight for every tourist. Agra Fort is the second most famous tourist site in the city. It won the Aga Khan Award for Architecture in 2004. It’s also a UNESCO World Heritage site. It was built by the third Mughal emperor Akbar. Around 1,444,000 builders worked 24 hours a day to complete this mammoth structure in 1573. Places to visit inside Agra Fort are Diwan-i-Am, Diwan-i-Khas, Moti Masjid, Rang Mahal, and Sheesh Mahal. Fatehpur Sikri is a city 39km and around one hour’s drive from Agra. It was previously called Sikrigarh, but after the victory of Akbar over the Sikarwar Rajputs, it was renamed to Fatehpur Sikri (“Fateh” means victory). The construction of the city was commenced under the reign of Emperor Akbar. It took 15 years to plan and complete the construction work of royal palaces, courts, harem, a mosque, private structures, and other utility buildings. The monuments at Fatehpur Sikri reflect the greatness and genius of Akbar in assimilating diverse regional architectural influences (Persian, Mughal and Indian). The most famous tourist places to visit in Fatehpur Sikri include Buland Darwaza, King’s Gate, Mariam-uz-Zamani House, Queen’s Palace and Anup Talao (pond). You can also visit the hotel ITC Mughal, one of the best hotels in Agra situated in close to the Taj Mahal. The hotel won the prestigious Aga Khan Award for its excellent representation of Mughal architecture. There are also many beautiful gardens in Agra where you can spend quality time in a peaceful environment. The most popular gardens are Mehtab Bagh, Ram Bagh, Dayalbagh Garden, Shah Jahan Park, Taj Mahal Garden, and Taj Nature Park. This list of places is for information purposes only. 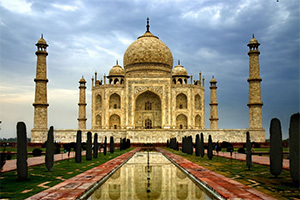 You can include and exclude any place from your Agra sightseeing tour package. Copyright © 2017 Shine Gold Tours India. All rights reserved.